Every day, I am asked questions about the new F-150 truck and most of them are about toughness, durability and whether the new 2015 model will be wimpier than its predecessors. Rest assured that the team at Ford Truck wouldn’t do anything to jeopardize their position as the top pickup for 37 years. When you sell a truck every 42 seconds, you don’t tamper with success. At Ford, that has meant consistent innovation and improvement. A few weeks ago, I was lucky enough to be one of a very small group of media people invited to Dearborn, MI, to check out the testing that is being done to make this the best Ford pickup truck ever. It’s always special to be behind the scenes when a new vehicle is being birthed, and this one will have been durability tested to 10-million cumulative miles prior to its actual introduction. Those miles — combining real world and simulated durability testing will make this the toughest, most capable F-150 while making it 700 pounds lighter, according to Pete Reyes, the chief engineer. While we were unable to see some of the long-term tests performed, we were privy to the 10 toughest. Some are so extreme that a five-day period equals 10 years or 150,000 miles of abuse. As the old saying goes, “Don’t try this at home.” Ford’s tests are done by professionals in controlled settings. Take my word for it. They do it all. 2015 Ford F-150 Torture Tests: Seven Channel Input from Texas Fish & Game Magazine on Vimeo. First, the seven-channel input to see how well the truck performs in situations that might bend the frame. A special torture rack, built by Ford, twists and shakes the truck seven ways at the same time for five days. This is the equivalent of 225,000 miles. The seven channels — four up and down, two side to side and one lengthwise down the center mimic the recorded forces the road surface put on various components that had been measured after running a fully-instrumented truck through durability courses. 2015 Ford F-150 Torture Tests: Power Hop Hill from Texas Fish & Game Magazine on Vimeo. At the Silver Creek durability course in Romeo, MI, one section of the route has 15 types of chuckholes, while another is made from broken concrete. A single pass makes grown men quiver with the pounding and speed. Imagine hitting a crater-sized pothole every five feet for miles while driving a steady 20 mph. I am told that 500 miles at Silver Creek is equal to 20,000 super rough miles that you would drive on rough roads. Also at Romeo, Ford created a washboard to replicate a steep off-road dirt trail in the Hualapai Mountains of northwest Arizona. The 11% grade is steeper than the final section of most ski jump ramps. This stresses engine and transmission components when the wheels lose contact and then return to the surface. To see how the bed of the truck might perform in actual use, Ford engineers dropped 55-gallon drums at an angle to make sure the impact was on the damage-causing rim of the drum. Impact was measured and adjustments made until the cargo box floor met expectations. In corrosion bath tests, the company developed a modified corrosion test using an acidified spray which was more aggressive on the high-strength aluminum alloy that makes up the body panels. The simulation was designed to reflect 10 years of exposure. 2015 Ford F-150 Torture Tests: Corrosion Bath from Texas Fish & Game Magazine on Vimeo. At the Davis Dam just outside Bullhead City, AZ, Ford tested the F-150 at posted speed (35-65 mph) on a 13-mile stretch while pulling maximum trailer loads and running the air conditioning full blast during an Arizona summer. 2015 Ford F-150 Torture Tests: Davis Dam from Texas Fish & Game Magazine on Vimeo. To test paint for the 2015 F-150, Ford engineers drove the truck 150 miles over gravel roads followed by 150 miles of extremely jagged scrap iron pellets (first passed through a blast furnace), and used oversized tires to spray the stones and iron at all of the truck’s surfaces. 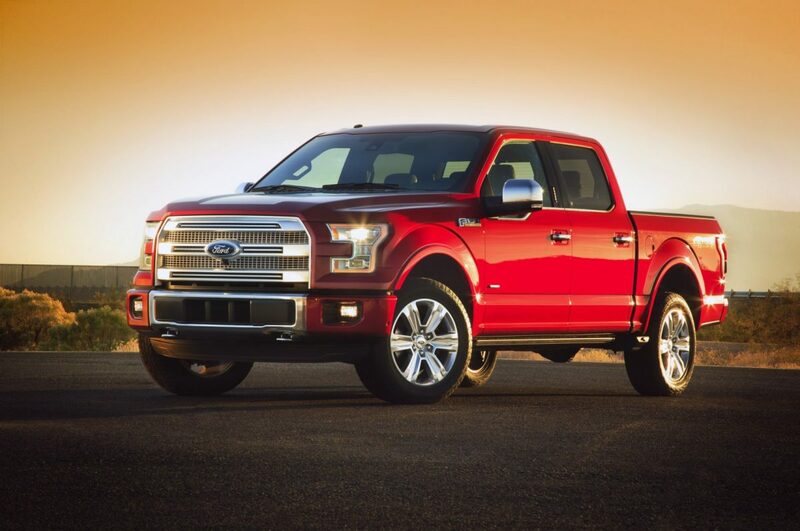 This test is performed over and over again to verify whether the paint quality will satisfy picky F-150 owners. 2015 Ford F-150 Torture Tests: Stone Peck Alley from Texas Fish & Game Magazine on Vimeo. In a dynamometer, engines are put through a simulation that mimics pulling a heavy trailer at full throttle up a steep grade. Then thermal shock testing takes the engine from polar temps to extreme heat in as little as 20 seconds followed by running the engine at max power while coolant and oil temperatures stabilize — first at 230 degrees and then at 270 degrees before being chilled again. Running this process 350 times over a 400 hour s;pan proves the durability of the engine block seals, gaskets, cylinder heads and liners. To prove out the truck’s performance under a common off-road situation which is the same as many motorists use to get unstuck in the snow, Ford tortures rear axles on a stand that creates impacts at about 2,000 lb.-ft. of torque. This is 130% more torque than the truck is capable of making; this assures that the rear axle and all of its components can withstand major abuse. Again for off-road terrain, the F-150 was tested on a set of parallel dirt mounds called the twist ditch creating a situation in which one front wheel hangs in the air while the opposing rear wheel leaves the ground repeatedly. Only two small patches of rubber are left to make contact with a slippery surface and maintain traction, putting extreme stress on the truck’s body and frame. 2015 Ford F-150 Torture Tests: Twist Ditch from Texas Fish & Game Magazine on Vimeo.